MHC class II restricted neoepitope vaccine: Promising strategy for immunotherapy. Citation: Wang Q,Chen F,Yang J, et al. MHC class II restricted neoepitope vaccine: Promising strategy for immunotherapy. J Med Oncl Ther 2018;3(1):15-21. The discovery of neoantigens has provided a promising target of cancer immunotherapy. Compared with MHC class II neoantigens, more lights shed on MHC class I neoantigens mediated cytotoxic CD8+ T cell responses. However, recent studies demonstrated that cancer vaccines induce both CD4+ T cell and CD8+ T cell immune responses can enhance anticancer efficacy, which provide a rationale for future cancer vaccine development based on MHC calss II neoantigens. MHC class II neoantigen, CD4+ T cell, Cancer vaccine. Emerging evidence has highlighted the relevance of neoantigens, which are created by somatic mutations during oncogenesis, in the induction of antitumor immune responses and tumor shrinkage. Due to the direct tumor killing capacity of CD8+ T cells, copious studies mainly focused on identifying MHC class I neoantigens and most previous cancer vaccines targeted MHC class I restricted neoepitopes. However, vaccines targeting MHC class I neoepitopes exhibited transient and weak therapeutic effects in many clinical trials , which demonstrated the indispensable role CD4+ T cells play in vaccine induced antitumor immune response . In 2014, Tran and colleagues also demonstrated the significance of MHC class II neoantigens in mediating tumor regression by infusion of tumor-infiltration CD4+ T cells targeting ERBB2 in a patient with metastatic cholangiocarcinoma . These findings suggest the importance of MHC class II neoantigen primed CD4+ The cells in the generation of an effective anti-tumor immunity. This review will focus on introducing the importance of MHC class II restricted peptide in vaccine development and strategies to utilize MHC class II neoantigens in vaccine generation. MHC II restricted neoantigens mediated CD4+ T-cell activation can influence cancer immunotherapy through multiple mechanisms (Figure 1). Activated CD4+ T cells can activate dendritic cells (DC) through CD40-CD40L, and help prime CD8+ T cells . Activated CD4+ T cells also secrete IFN-γ, whence increase expression of MHC class I and class II molecules in tumor cells and enhance tumor recognition . Besides, CD4+ T cells are very important in maintaining CD8+ T-cell functions and promoting their recruitment and infiltration through secretions of various cytokines . In addition to their role as T helper cells, CD4+ T cells can directly kill tumor cells in an MHC class II-dependent and independent manner . 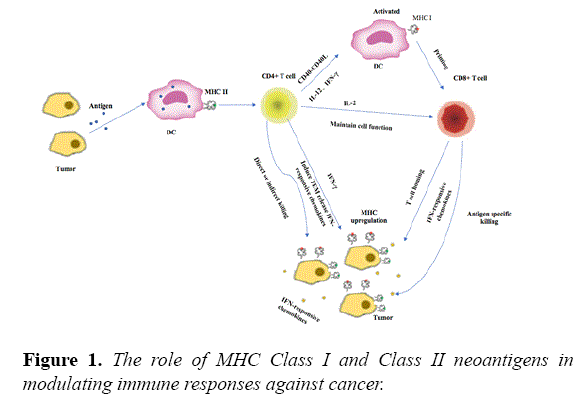 Figure 1: The role of MHC Class I and Class II neoantigens in modulating immune responses against cancer. Moreover, MHC class II epitopes are more abundant than MHC class I, and CD4+ T cell can reshape the tumor microenvironment in favor of antitumor responses . In a mouse model of hepatocellular carcinoma, CD4+. The cells but not CD8+ CTL are primed by a dendritic cell (DC)-based cancer vaccine, which play a key role in the induction of antitumour activity . A preclinical study showed that the immunogenic mutanome is predominantly recognized by CD4+ T cells during vaccination of three independent mouse tumor models with synthetic 27 mer peptides encoding the mutated epitopes . Besides, this vaccination therapy can mediate robust and prolonged antitumor responses in vivo. Schumacher et al. also reported that IDH1R132H-specific vaccination could elicit a robust CD4+ T cell response and directly eradicate established mutation-positive gliomas in a mouse model . In two phase I clinical trial, Ott et al. and Sahin et al. studied high-risk melanoma patients who were vaccinated with vaccines encompassing selected personalized neoantigens. These two studies shown that most of vaccine induced immune responses are mediated by CD4+ T cells and most of the vaccinated patients achieved significant clinical benefit either with vaccine therapy alone or combination therapy . Thus targeting MHC class II neoantigens may be a promising approach in improving the therapeutic efficacy of cancer vaccines [12,13]. Since antigen processing is different for MHC class I and MHC class II molecules, immunological considerations are made in conjunction with prediction results to determine what lengths and sequences will be ultimately incorporated into the vaccine. Short length peptides which are comprised of purely the epitope sequence bind exogenously to Class I MHC on the cell surface, especially Class I MHC on non-professional DCs, can induce tolerance or anergy of CD8+ T cells. Due to the weak and transient immune responses mediated by short peptide vaccination , it is necessary to be delivered along with potent adjuvants to augment CD8+ T cells responses . Compared with minimal peptide vaccines, the long peptide vaccines need to be processed by dendritic cells, which can produce peptides with higher affinity with MHC molecules and a better immunogenicity [16,17]. Besides, the long peptide vaccine can effectively induce both antigen-specific CD4+ and CD8+ T-cell responses, which has been proved in a phase I vaccination study with dendritic cells loaded with NY-ESO-1 and α-galactosylceramide . Gasser O and his colleague observed early onset, highly significant, sustained NY-ESO-1- specific CD4+ T-cell responses, followed by very high frequencies of specific CD8+ T-cells, which also demonstrated the significance of CD4+ T cell in activating and sustaining the effector phase of CD8+ T cells. Another clinical trial, 9 recurrent malignant glioma patients were treated with SurVaxM, which contains a synthetic long peptide mimic that spans amino acids 53 through 67 of the human surviving protein sequence. The robust CD4+ T cell stimulation can also be observed in vaccination patients and three patients maintained a partial clinical response or stable disease for more than 6 months. Progression-free survival was 17.6 weeks, and overall survival was 86.6 weeks . Due to the tumor heterogeneity, single neoepitope vaccine may cause the outgrowth of tumor without the expression of this mutation . Thus, vaccines composed of multiple peptides derived from MHC class I and II neoantigens can enhance the antitumor immunity and reduce the risk of tumor recurrence. Recently, Ugur Sahin and his colleague developed a personalized poly-neoepitope RNA vaccine composed of ten predicted MHC class I and class II neoepitopes for each patient. Most of the neo-epitopes mounted exclusively CD4+ responses with a smaller fraction recognized by CD8+ T cells. This vaccine can augment pre-exiting responses, as well as de novo responses. It can also help in maintaining CD8+ T cell function and prevent the recurrence of 2/5 patients with metastatic disease. And one patient achieved complete response with the combination treatment of vaccine and PD-1 blockade, which provide a rationale for combining the vaccine with other therapy . At the same time, Ott et al. vaccinated six high risk melanoma patients with SLP (synthetic long peptide) (up to 20 total peptides in 4 pools for each patient) after surgical resection of the tumors (NCT01970358). The vaccine induced T cell responses were predominantly recognized by CD4+ T cells. Of the six patients, 4 patients remained recurrence-free during follow-up of 20-32 months after vaccination. The remaining two relapsed participants had their new tumors vanished after treatment with anti-PD-1 antibody . Vaccines have tremendous potential for cancer immunotherapy. • Whereas CD8+ T cell can directly kill tumor cells, CD4+ T cells serve as a helper cell that supports the activity of other immune cells. The vaccines comprised of MHC class I and MHC class II neoepitopes have synergistic effects, which can induce more potent and long-lasting anticancer immunotherapy. • Poly-neoepitopic vaccines can kill a large fraction of tumor cells containing these mutations and reduce the risk of tumor recurrence. • To date, most of the vaccine clinical trials have shown limited promise, which indicated that the patients with advanced or metastatic diseases may not benefit from the vaccination alone . • A large serial of studies suggested that large tumor burden may down regulate the expression of high affinity neoantigens and result in immunosuppressive tumor microenvironment . • Besides, successful development of vaccine-induced antitumor response will take a long time to repeatedly injection every once in a while. The patients at the end stage may die before the vaccine works. Thus, patients at the early stage or with low tumor burden may benefit a lot from poly-neoepitope vaccine, while for patients with the heavy tumor burden, the combination of various therapies will be necessary to improve treatment efficacy. Rosenberg SA, Yang JC, Restifo NP. Cancer immunotherapy: Moving beyond current vaccines. Nat Med. 2004;10:909-15. Sharma RK, Yolcu ES, Srivastava AK, et al. CD4+ T cells play a critical role in the generation of primary and memory antitumor immune responses elicited by SA-4-1BBL and TAA-based vaccines in mouse tumor models. PloS one. 2013;8:e73145. Tran E, Turcotte S, Gros A, et al. Cancer immunotherapy based on mutation-specific CD4+ T cells in a patient with epithelial cancer. Science. 2014;344:641-5. Wang RF. The role of MHC class II-restricted tumor antigens and CD4+ T cells in antitumor immunity. Trends Immunol. 2001;22:269-76. Quezada SA, Simpson TR, Peggs KS, et al. Tumor-reactive CD4(+) T cells develop cytotoxic activity and eradicate large established melanoma after transfer into lymphopenic hosts. J Exp Med. 2010;207:637-50. Arina A, Karrison T, Galka E, et al. Transfer of allogeneic CD4+ T cells rescues CD8+ T cells in anti-pd-l1-resistant tumors leading to tumor eradication. Cancer Immunol Res. 2017;5:127-36. Matsuzaki J, Tsuji T, Luescher IF, et al. Direct tumor recognition by a human CD4(+) T-cell subset potently mediates tumor growth inhibition and orchestrates anti-tumor immune responses. Sci Rep. 2015;5:14896. Kreiter S, Vormehr M, van de Roemer N, et al. Mutant MHC class II epitopes drive therapeutic immune responses to cancer. Nature. 2015;520:692-6. Homma S, Komita H, Sagawa Y, et al. Antitumour activity mediated by CD4+ cytotoxic T lymphocytes against MHC class II-negative mouse hepatocellular carcinoma induced by dendritic cell vaccine and interleukin-12. Immunology. 2005;115:451-61. Schumacher T, Bunse L, Pusch S, et al. A vaccine targeting mutant IDH1 induces antitumour immunity. Nature. 2014;512:324-7. Harjes U. Tumour vaccines: Personal training by vaccination. Nat Rev Cancer. 2017;17:451. Baxevanis CN, Papamichail M, Perez SA. Prostate cancer vaccines: The long road to clinical application. Cancer Immunol Immunother. 2015;64:401-8. Hellmann MD, Snyder A. Making it personal: Neoantigen vaccines in metastatic melanoma. Immunity. 2017;47:221-3. Wang RF. Identification of MHC class II-restricted tumor antigens recognized by CD4+ T cells. Methods. 2003;29:227-35. Romero P, Banchereau J, Bhardwaj N, et al. The Human Vaccines Project: A roadmap for cancer vaccine development. Sci Transl Med. 2016;8:334. Melief CJ, Van der Burg SH. Immunotherapy of established (pre)malignant disease by synthetic long peptide vaccines. Nat Rev Cancer. 2008;8:351-60. Baumgaertner P, Costa Nunes C, Cachot A, et al. Vaccination of stage III/IV melanoma patients with long NY-ESO-1 peptide and CpG-B elicits robust CD8(+) and CD4(+) T-cell responses with multiple specificities including a novel DR7-restricted epitope. Oncoimmunology.2016;5:e1216290. Gasser O, Sharples KJ, Barrow C, et al. A phase I vaccination study with dendritic cells loaded with NY-ESO-1 and alpha-galactosylceramide: Induction of polyfunctional T cells in high-risk melanoma patients. Cancer Immunol Immunother.2018;67:285-98. Fenstermaker RA, Ciesielski MJ, Qiu J, et al. Clinical study of a survivin long peptide vaccine (SurVaxM) in patients with recurrent malignant glioma. ancer Immunol Immunother. 2016;65:1339-52. Mahmoodi S, Nezafat N, Barzegar A, et al. Harnessing bioinformatics for designing a novel multiepitope peptide vaccine against breast cancer. Curr Pharm Biotechnol. 2016;17:1100-14. Sahin U, Derhovanessian E, Miller M, et al. Personalized RNA mutanome vaccines mobilize poly-specific therapeutic immunity against cancer. Nature. 2017;547:222-6. Ott PA, Hu Z, Keskin DB, et al. An immunogenic personal neoantigen vaccine for patients with melanoma. Nature. 2017;547:217-21. Patel A, Kaufman HL, Disis ML. Next generation approaches for tumor vaccination. Chin Clin Oncol. 2017;6:19. Schumacher TN, Schreiber RD. Neoantigens in cancer immunotherapy. Science. 2015;348:69-74.